I hope you all had a great reading week last week! I finished up reading Life or Death by Michael Robotham, my planned book for the week, as well as made a start on the second book within The Chronicles of Narnia series - The Lion, the Witch, and the Wardrobe. Whilst I'm working my way through The Chronicles of Narnia, the books might not always feature here on 'It's Monday! ', but I am steadily working through all seven books. In the way of reviews, I'm planning to share a week long feature once all the books have been read, with a review for each book - I'm writing the reviews as and when I read them though. 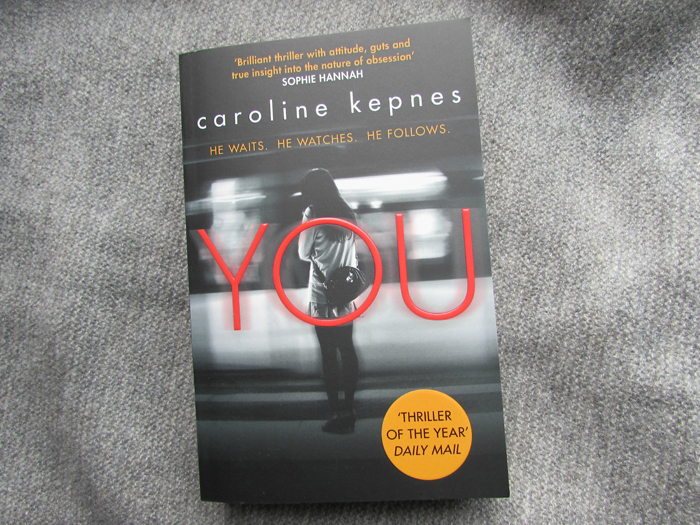 My primary book for this week is You by Caroline Kepnes. There was so much talk about this thriller last year, but I'm only just getting round to it now. I'm kind of funny with books that are talked about often, not necessarily hyped but just a lot of buzz, and so in many ways I intentionally waited until all that had died down in order to read You. I've hopes for this one, not exceptionally high hopes, but I've had a lot of good luck with my books so far this year (all 5 and 4 star reviews) so I hope that'll continue with this book. I am really curious what you'll think of You. I'm reserving my comments for when you finish. Enjoy!! Haha - I don't know if that's a good or a bad thing! Thoughts so - it's kind of uncomfortably creepy. Sounds interesting! I'm curious as to your thoughts - from stalker to boyfriend? I might just have to read it to see how that plays out. I'm in the early stages of the book, and it's an 'interesting' read. I started You, but had to pull away for a while...I'm not sure why. I guess I wasn't in the mood for his creepiness. LOL. But I hope to return to it. Thanks for sharing...and for visiting my blog. Haha! I'm still in the very early stages of the book, and I can see why you'd need to do that. I don't know what I was expecting... But not this uncomfortable creepiness. I remember You getting discussed a lot back when it came out, but don't remember what the consensus was or if there was one! Hope it works for you! I recall some good reviews and some not so good - no hype per se, but a lot of talk. I know some books hit the reading world with a big buzz! Hope this one lives up to all the hype. Many of them do! Hmm... Well, my experiences with buzz worthy books doesn't always end well. We shall see! I haven't read You yet. I think it is on the stacks. You sounds so creepy. I will look out for your review! Hooray for a great start to bookish 2016! It is so nice to have a long burst of 4 and 5 star books. Creepy is a perfect word to use... A tad too creepy. It sure is - I hope it isn't a January fluke! You sounds fantastic, it is on my TBR list. Hope your enjoying it. I'm still in the early stages, but it's definitely unexpected so far. Love Chronicles of Narnia-when I was a kid my mom read most the series out loud to us while we drove halfway across the country on vacation to Disneyworld :) I actually remember her reading the books more than Disney! Haha - well they must of went down well then! The Narnia books were a childhood favourite. You sounds disturbing. I hope you enjoy it. I haven't read Narnia for a very long time. I used to read the books to my classes when I was teaching. I haven't even really seen the first movie in its entirety. I'm going through the HP books for a HP Binge but seem to have stopped after five. I need to load up the sixth. But I have a historical romance right now; I kind of like the comfort of one book at a time. I've seen a couple of the Narnia films, so I'm vaguely familiar with the starting of the stories - I'm enjoying the books more so far. It's nice to read just one book at a time. I do tend to do that, although I derail when not having anything good to read so flit between too many titles, I'm reading the Narnia books as a short filler between books. I hope you're enjoying your current read! I love the idea of a weeks' worth of Narnia- how fun. Haven't read those in ages... love the world he created. I was initially just going to do the one post on the Narnia books, sharing my thoughts on the series as a whole, but I think that would just get far too long. Haha! I hope you enjoy YOU, I didn't love it as much as I hoped I would. But I certainly didn't hate it either. Ah, I'm in the early stages, but I get that feeling so far. I guess it's because of the success of Gone Girl and Stranger on a Train but there seem to be so many thrillers right now. I love a good thriller - I'm not complaining. Haha!